Best Low Light Aquarium Plants - Easy Care, No Expensive Lighting! Home Plants Best Low Light Aquarium Plants – Easy Care, No Expensive Lighting! Home aquariums are magical because they decorate spaces with life. Unlike an artist or a stamp collector, aquarists are nurturers. It’s our responsibility to ensure that the creatures we take care of will enjoy and thrive in the environment we provide for them. Low light aquarium plants are ideal for beginner and seasoned aquarists alike. They often require minimal effort to maintain and, in many cases, no extra care (or equipment) is necessary to watch them flourish. To help get you started with these low-maintenance plants, we’ve put together a list of the 15 best low light aquarium plants below, and detail their care requirements, water parameter needs, compatibility with other plants and fish and more. We’ll also cover some of the benefits of having plants in your aquarium and how to choose the right ones for your planted tank. What Makes a Plant ‘Low Light’? Benefits of Plants in an Aquarium? Where do You Wish to Place the Plants? How Big is Your Aquarium? What Fish and Other Plants Will Share the Aquarium? We’re pretty sure that you’re already familiar with photosynthesis, but if you want a successful underwater garden, you might have to deepen your knowledge of it. Plants can only make use of the nutrients they “eat” when they also receive direct sunlight, and the difference between a healthy plant and a starving one lies in both the quality and the quantity of the light that you feed it. High-light plants are those that favor direct sunlight. Medium-light species grow best in diffused sunlight – for example, in the shade or behind a window. Low-light varieties, (sometimes called shade tolerant plants) receive no direct sunlight, and so, because they have less to eat, generally take longer to grow. Most aquarists use the watts per gallon method when it comes to lighting. According to this system, one to two watts is low, two to three watts is medium, and three or more watts is considered high light. Although many people are satisfied with this method, it can be unreliable. And that’s where science comes in. Photosynthetically Active Radiation (PAR) meters are more accurate. They measure the color and intensity of artificial lighting for plants to get the luminosity as close as to natural as possible. Aquatic plants are a fresh and fun addition to your tank. Although they might be initially challenging to new aquarists, they have both aesthetic and functional benefits. Let’s take a look at some of those benefits now. Plastic plants are perfectly acceptable if low upkeep requirements are your primary concern. But, aesthetically, they look obviously plastic from a mile away. In contrast, live plants will make your tank look more realistic and natural. They also breathe new life into your tank – literally. They have a fascinating and exotic quality that synthetics just can’t achieve. There is also versatility when keeping live aquarium plants. As with any other garden, you can design and personalize your planted aquarium to suit your space and tastes. Freshwater aquarium plants give your fish a natural habitat inside their tank. Smaller creatures, such as shrimp and fry, can use the leaves to hide from predators. This is, of course, better suited to them than synthetic decorations. Aquarium plants can also supply shade to your fish and other creatures, giving them a cool, natural place to hang out in. Certain types of fish will snack on your plants. It all depends on which fish and which plants you put together. This might not be a benefit to those aquascapists who don’t want their critters destroying their designs, but it’s a bonus for fish keepers that won’t mind if their foliage get nibbled. It’s no surprise that plants absorb carbon dioxide and supply oxygen, but that’s not all they do. Aquarium plants will also act as a filtration system by absorbing nitrates (which contaminate water). They can even break down and absorb the waste excreted by fish. They’ll keep your tank clean, and significantly improve your aquarium’s environment. Wonderful as this may be, it has to be said that plants are by no means an alternative to mechanical filters, and should never be used as a full replacement for them. Algae are plants too, so it’s not an entirely terrible thing to have some in your tank. But they spread like butter on warm toast and, in excess, they can be quite damaging to your tank’s ecosystem. Freshwater aquarium plants reduce the occurrence of algae by using up the resources they depend on to grow. This survival of the fittest only counts with fast-growing aquatic plants, but it’s definitely worth looking into if algae is an endless problem for you. Picking the plants that are right for you will require some thought and there are a few key considerations to keep in mind before you go shopping. The following list should help you out. Mid-ground plants are the point of focus for most observers. Medium height varieties work best here. You can add tall plants if you like – just remember to leave room for your fish to swim around in. Foreground plants should be low-growing so they won’t obscure the rest of your tank. Carpet varieties are a fantastic choice. They fill the space without drawing attention away from the rest of your aquarium. Rooted plants will grow from whichever substrate you have on the floor of your tank. Floating plants will not have their roots attached to anything and will grow just on top of the water, like lilies. Submerged plants are rooted species that grow underwater. Emerged plants are rooted but grow above water. Don’t forget that you are spoiled for choice with an array of shapes, sizes, and colors too. It’s easy to forget that plants grow. Consider the size of your aquarium based on how big your plants will become, NOT how big they are now. Otherwise you might run into problems later. Don’t forget to account for your fish as well. They should be able to move around comfortably. Before you buy a plant, make sure your tank is appropriate for it. Regardless of size, not all plants will survive in small tanks. Plants and animals have different needs when it comes to the quality of your water. These water parameters (the condition of your water including concerns like salinity and pH levels) are a huge factor in your ecosystem’s survival. Before you put different species together, you have to make sure that their needs match. Your water has to be right for all of its inhabitants, otherwise some will die. PH levels are important because some plants have a lower tolerance for acidity than others. Most can survive in pH levels ranging between 6.5 to 7.5, but you will have to determine the individual varieties threshold. Water hardness describes the level of dissolved minerals in your water. Hard water has a high mineral content (mostly calcium and magnesium), and soft water has very little. Think of it as the type of water that your plant will drink. Just as we can’t drink salt water, some plants will reject mineral water. More often than not, plants will be able to withstand hard water but do your research to make sure. Water temperature will also determine the survival of your plants. Some people assume that all aquatic plants prefer water that is between 70 and 80 degrees Fahrenheit, but this is not true. Some will only grow in cool or cold water, and it’s up to you to research the specifics. There are other things to consider too, such as how floating plants will cast shade on the creatures living beneath them; or that some fish will devour and destroy certain foliage if given half a chance. Low light plants are usually slow growing and don’t require that much care. However, some do grow quite fast and need a surprising amount of pruning to control. How much time you are willing to invest in taking care of your aquarium should inform your choice of species. When left unattended, fast-growing plants tend to invade the entire tank and could affect the fish and other plants living there. They might deprive other plants of nutrients and light, and obstruct (or even trap) your pets. Now that we’ve had an overview of low light plants, let’s take a look at 15 excellent such varieties for your aquarium. There are countless species of aquarium plants, and each has their own benefits and appeal. Choosing which ones suit your needs can be an overwhelming task, and buying the wrong ones can be a waste of time and money if all they do is struggle and ultimately perish, or cause harm to existing tank inhabitants. With that in mind, here’s a list of our recommendations for the best low light aquarium plants to get you started. Color form: Green, brown flowers. Growth rate: Aggressive, requires frequent pruning. The first low light aquarium plant we’ll look at, hornwort is a rootless, free-floating plant that has stiff, needle-like whorls. Its shape is reminiscent of a raccoon’s tail, hence its nickname, coontail. Hornwort leaves come in varying shades of green, and they produce tiny brown flowers. It bears fruit too – nuts that are approximately a quarter inch in size. Each plant can grow as tall as 10 feet. A single Hornwort is likely to have multiple stems, which creates the illusion of more than one plant. This makes it a favorite among aquarists. Hornwort is native to North America. It grows in a number of environments, including moving and still water, marshes, swamps, and forests. Hornwort has ancient origins and has been traced as far back as the Devonian period. It’s said to be one of the first plants to evolve on land. Due to its rapid growth, you need at least a 15-gallon tank to plant it in. Nitrogen levels need to be low, so a good filter is important. Plant it in clean water and remember that regular water changes are necessary. Hornwort grows comfortably in temperatures from 59–86 degrees Fahrenheit, pH levels between 6.0 and 7.5, and water hardness between 5 and 15 dGH. Hornwort will get along well with fish as it provides a nice cover for them. This is especially true for live-bearing fish. It’s also a great match for guppies. It sheds and can be a bit of a messy plant, but snails and loaches do a great job of cleaning up after it. In a similar vein, angelfish will enjoy eating the leaves, so don’t mix the two if you want to keep your hornwort in one piece. If you want to keep hornwort with other plants, keep an eye on it. It will deprive them of nutrients (and perhaps even light) since it will propagate and spreads quickly. Other than regular pruning and water changes, hornwort requires no special care. You want your planted tank to look good and are willing to spend some time on maintenance. Hornwort also suits aquarists who keep fry and other small fish, live-bearers, and scavenging fish in their tanks. It’s an excellent choice when fighting algae as well. You own a smaller tank, don’t have time for pruning or care, or have other plants that will suffer if left unattended with hornwort. Color form: Dark to bright green. Growth rate: Low to moderate. There are numerous variations of Java fern that differ in shape and texture. Typically, it has sturdy blade-shaped leaves that can grow up to 13.5 inches tall and 8 inches wide. It’s dark-to-bright-green colored and develops dark bumps during propagation. It’s a floating plant that alos does well when anchored. Java fern originated in Southeast Asia; particularly Indonesia, Malaysia, and Thailand. It’s an amphibious plant that is mostly found in moving waters in tropical jungles. It also grows on and near rocks, waterfalls, tree trunks, and even along the ground. There is a myth that Java fern can survive in brackish water, but it’s a freshwater species, and there is no substantial evidence confirming this. Java fern doesn’t need extra CO2. Filters will provide the moving water the plant thrives in. Recommended water parameters include hardness levels between 3 and 8 dGH, pH levels of 6.0–7.5 and temperatures ranging from 68–82 degrees. It’s advised that you don’t plant them in tanks smaller than 10 gallons. They grow in both low and moderate light and are best placed in the shade. Bright light can cause discoloration. Java fern leaves are tough, so most fish won’t care to eat it. Be careful though, because young Java ferns are soft and easily damaged if placed with big and/or excitable fish. The same applies to fully grown ferns if they are placed with aggressive shredders. Java fern has excellent compatibility with other plants. Java ferns require no fuss at all. They grow so slowly that you’ll only have to prune them once or twice a year. You are looking for an easy, beginner plant that does not need special attention or conditions. You’d prefer a more challenging plant. Java ferns are extremely low maintenance, so if you are looking for something you can nurture, it’s better to go for a faster growing or specialized species. Color form: Green, white flowers. Growth rate: Fast or aggressive, depending on light conditions. Brazilian pennywort looks like nasturtium or a lily pad, with small, flat leaves that float on the water’s surface. It produces small white flowers when not submerged. It grows up to 24 inches tall and 6 inches wide. Its stems are strong and jointed. It’s often referred to as Brazilian ivy. Brazilian pennywort is native to South and Central America and is found between Argentina and Mexico. It will survive in most conditions but prefers wetlands and marshes. It’s often used as a spice and a medicinal herb and has a peppery flavor. It can be placed in any size tank, but it grows fast, so the bigger the better. The more light it receives, the quicker it will grow. Fertilizers will speed up its growth too. Recommended water conditions are temperatures between 68 and 82 degrees, pH levels of 6.0–7.8, and hardness anywhere between 0 and 30 dGH. Steer clear of goldfish and digging fish as they will devour Brazilian pennywort. It’s mostly compatible with other plants, but it can invade the entire tank, so plan accordingly. It will cast shade on plants below it, so make sure it won’t interfere with their lighting requirements. Brazilian pennywort is capable of growing a couple of inches a week. It’s a demanding plant in terms of pruning, although it has no other special requirements. You’re looking for an unconventional aquarium plant that requires some love and care. It’s a pretty floating variety that certainly stands out, and, with some pruning, will add a lot of character (and shade) to your tank. You are looking for a slow-growing, minimal effort plant, or if you have goldfish and other incompatible fish in your tank. Care level: Easy to Moderate. Bacopa caroliniana is a small herb that has thick greenish-yellow leaves which appear bronze or red when placed in high-light conditions. It’s a creeping plant that sprouts blue-purple flowers. These flowers will be short-lived if produced underwater. It typically grows up to 6 inches tall, and 24 inches wide. Bacopa caroliniana is native to the Southern US. Its foliage is lemon scented and for that reason, its common name is lemon bacopa. It’s a perennial plant that grows well in wetlands, marshes, and along shorelines. It’s been used in medicine to treat a wide array of illnesses, including epilepsy, vitamin C deficiencies, and rheumatism. 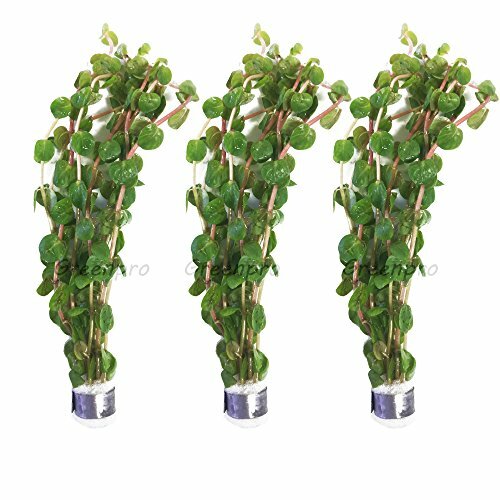 Bacopa caroliniana is a versatile plant that will grow in various lighting and water conditions. It typically grows up above the water surface, though it can survive submerged. The best water conditions for bacopa are pH levels between 6.5 and 7.5, water hardness ranged between 0 and 30 dGH, and temperatures between 72 and 82 degrees. This plant is an excellent companion for fish and other plants, though be considerate of where you place it. Since it can grow above the water surface, it can cast a shadow on plants underneath it. Bacopa caroliniana grows quite slowly but will require pruning and maintenance every so often. Although it’s not absolutely necessary, it’s recommended that you give it fertilizer every once in a while. You are looking for a moderately easy plant to add to your tank, you want a compatible companion for other existing species in your tank, or are looking for a pretty stem plant. You’d prefer a fully submerged plant, or would rather go for something more exotic. Hygrophila Corymbosa is an amphibious plant that has thick stems and dark green, quill-shaped leaves. It might not be much of a looker at first glance, but when it bears its beautiful purple flowers, it has the chance to become one of the prettier inhabitants of your aquarium. Some species of Hygrophila can grow to a maximum height of 2 feet. The name of this plant translates to “moisture-loving,” which tells you all you need to know about it. It originated in Southeast Asia and grows naturally in marshes, swamps, and wetlands, as well as alongside rivers, lakes, and streams. Although it’s an emerged plant, it can survive fully submerged. Its popularity introduced it to Mexico, where it now poses a threat to the country’s native aquatic flora. There are no special requirements, although you should consider your lighting. Though Hygrophila will do just fine in low-light conditions, it takes on a beautiful reddish-pink color when placed under brighter lights. You also want to make sure that your stems are kept separate from each other. If they become tangled, the light will not be able to reach them since this plant is so thick. The pH levels should stay between 6.5 and 7.5. Water hardness should be 2–15 dGH, and the temperature should be between 70 and 82 degrees. Hygrophila grows so rapidly that there’s a risk it will dominate your tank and affect your fish and other plants. However, so long as you keep it trimmed, it’s strong and shouldn’t give you too much hassle. Protect it from aggressive and shredding fish, just in case. As mentioned above, you will spend a lot of time pruning hygrophila if you don’t want it to take over your tank. Otherwise, it is an undemanding plant that requires no special attention or maintenance. You want a pretty flowering plant for your collection, or you don’t mind spending time pruning and trimming regularly. You won’t spend time nurturing this plant and prefer something low-maintenance instead. The waterwheel is a rootless carnivorous plant, similar to the terrestrial Venus flytrap. Its leaves (and traps) grow in a circular pattern and look almost like the spokes of a wheel – hence its common name. It produces white flowers. Waterwheels don’t usually grow taller than 7 inches, with the leaves spreading no further than half an inch. Waterwheel is the most common carnivorous plant. It’s native to Europe, Africa, Asia, and Australia. It is the only surviving species in the genus Aldrovanda, with 19 others now extinct. They are often found growing near reeds. Waterwheel is one of those plants that will survive in almost any conditions you put it in. While they prefer bright light, they will do just fine in low-light conditions. They grow in acidic water that is low in nutrients. Aim for pH levels between 5 and 6.8, though it will survive in water levels of 7–7.9. Water hardness should be 2–15 dGH, and temperatures should stay between 70 and 82 degrees. Don’t be frightened by this plant’s carnivorous status. It’s highly unlikely it will harm your fish. It mostly feeds on small insects such as mosquito wrigglers. Waterwheels will not compete with algae, which is something to consider. Since they survive best in low-nutrient waters, it might be better to separate them from other plants which need fertilization. That said, they do well with other marsh plants. To grow waterwheel successfully, you will need a 10-gallon tank at least. Change the water regularly as waterwheel prefers clean, shallow water. They grow moderately fast in perfect conditions, but do not grow very tall and so won’t need much pruning. You are looking for a beginner’s carnivorous plant and are happy to do regular tank maintenance. You are concerned about smaller fish and fry and don’t want to do regular water changes to keep this plant happy. Color form: Green, red, brown. 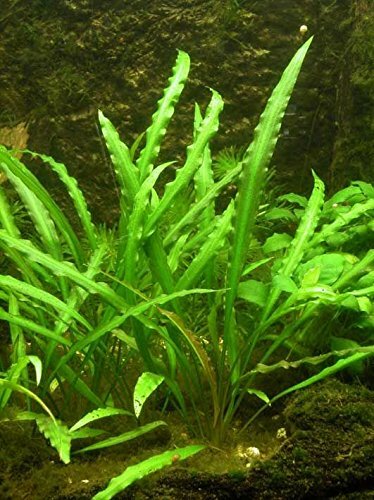 Cryptocoryne is a popular low light aquarium plant and comes in a variety of sizes, colors, and textures, though it’s mostly found as a green, red, or brown rosette plant with blade-shaped leaves. It’s quite small, grows thick and hardy, and produces small spadix flowers. Cryptocoryne grows to a maximum of 5 inches. Native to Sri Lanka and named after the aquarium enthusiast Albert Wendt, Cryptocoryne wendtii is found mostly near rivers and streams in shaded areas. It’s now considered an invasive species in Florida. Crypt is a determined survivor that will grow under both low and high lighting, hard and soft water, and differing levels of acidity. That said, the recommended conditions to grow it in are less than 15 dGH, pH levels between 6.0 and 8.0, and temperatures ranging from 72–78 degrees. Planting it directly into your substrate is important. It’s interesting to note that Cryptocoryne wendtii does not enjoy changing conditions and will appear to wither once you plant it (something called crypt melt). It’s only adjusting to its new waters though and will be as right as rain if given time. The only warning here is that cichlids will tear this plant’s leaves, so if you are keeping it for aesthetics it’s better to separate the two. Otherwise, it’s a highly compatible plant that won’t meddle with other tank inhabitants. Since Cryptocoryne wendtii is sensitive to changing water conditions, you will have to give it extra attention when you plant it to make sure it will adjust accordingly. It grows moderately, and regular trimming will be necessary. You are an enthusiastic aquarist who wants to add some color to your planted tank, or a beginner aquarist looking for a bit of a challenge. You keep cichlids in your tank, are searching for tall or far-reaching plants, or want a species that looks good right away. Growth rate: Slow to moderate, depending on the water conditions. A popular choice for planted tanks, one of Java moss’ many nicknames is Christmas tree moss, a fitting and adorable description of what it looks like. The bright green leaves branching out irregularly give it the appearance of grass, so it works well as a carpet plant. It’s free floating but will anchor onto rocks, substrate or even tank decorations. It can grow up to 7 inches tall. Like Java fern, it’s native to Southeast Asia, Indonesia in particular. It grows in humid, damp, and moist conditions. Java moss is found on rocks, tree trunks, river banks and even along the ground. Java moss will grow in most conditions, but the ideal water temp is 59–86 degrees, pH levels should be 5.0–8.0, and dGH should be less than 20. You will need at least a 5-gallon tank. Java moss will grow under most light conditions. 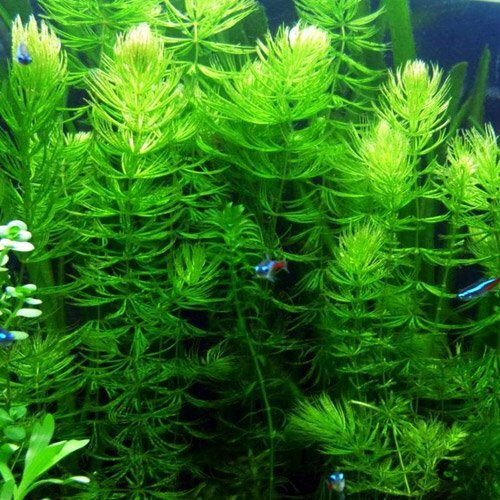 Java moss gets along well with other plants and is an excellent resource for fish. Most will nibble on it, and it provides a hiding place for fry. It’s also handy for breeders, as it’s the perfect place for fish to attach their eggs. You can choose whether or not you want to bother with your Java moss. If left alone it will thrive, but if you want to trim it, you’re welcome to. Its growth rate depends on your water. Warmer temperatures will slow its growth. You are an absolute beginner and want something easy to start with, a breeder who needs shelter for fish eggs, or an aquarist seeking a bright carpet moss. You prefer regular maintenance or want a plant that is suited for seasoned aquarists. This bright green plant has thin blades that grow in clumps. It’s a floating species, but can be rooted too. It can reach shocking lengths of 35 inches tall. It grows minute, staminate flowers. It’s native to the Americas, namely Canada, the United States, Central America, the West Indies, and some parts of South America. We call it guppy grass because of its notable use as a shelter for baby guppies. It grows naturally submerged in streams, rivers, ditches, canals, and ponds. Guppy grass will thrive in fairly mild conditions, with pH Levels between 6.0 and 7.0, and temperatures between 72 and 84 degrees. Water hardness is best between 2 and 10 dGH. It’s a great low-light choice, but will appear brighter in high light. 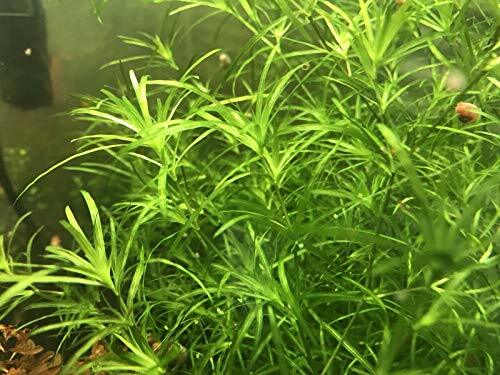 Guppy fry will enjoy having this plant in the aquarium and, like mosses and grass, it provides shelter for small fish. One thing to note, though, is that it grows tall very quickly; if placed with other creatures it might get in the way. You are breeding guppies and don’t mind the high care levels required to keep this plant in order. You won’t be able to trim or prune it often, or want your aquarium to look neat and tidy. Placement: Foreground, mid-ground, or background. Guppy grass’s appearance is close to terrestrial grass. It has bright, thin blades that grow to a maximum of 12 inches. When trimmed, it looks great as a carpet plant and provides a beautiful, natural looking cover to the base of planted tanks. Sagittaria subulata is native to Colombia, Venezuela, and the coastline of the USA. It was naturalized in the UK but is now classified as extinct there. It grows naturally in both salt and fresh water, and can also thrive in marshes and wetlands. Its common name is dwarf Sagittaria. Sagittaria subulata is a bit of an oddity because it will grow in varying conditions, and is not sensitive to temperature change, hardness, or light. Still, there are ideal conditions: pH of 6.5–7.4, temperatures between 72–78 degrees, and hardness between 0 and 30 dGH. Snails and algae might attack Sagittaria subulata, but it is still compatible with most plants and fish. Since it’s like grass, it will provide cover for fry. Sagittaria subulata grows relatively quickly and will require frequent trimming if you don’t want it to take over your tank. It’s easily affected by low iron levels and might discolor if it’s not planted in a nutrient-rich plant substrate. You are looking for a durable plant that you can use a number of ways in aquascaping, and don’t mind spending time pruning it. If you are concerned about the rapid growth rate, struggle with algae, or keep snails in the same tank. Anubias nana is a dark green, rooted rosette that grows in bunches and can survive either submerged or emerged. It has white spadix flowers. 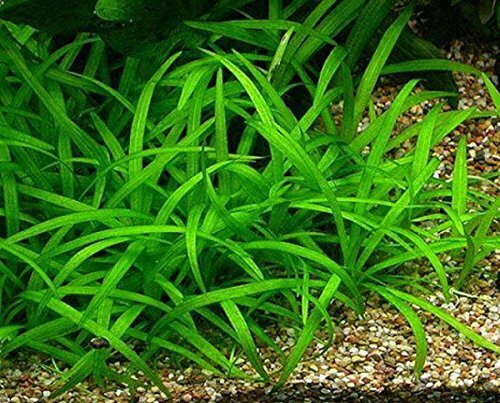 Its arrow-shaped leaves and thin stems make it a dazzling choice for aquarists. Anubias nana is native to Cameroon and grows best in tropical climates. It is most often found in dark wetlands, forests, along riverbanks and streams, or growing between rocks and driftwood. Due to its tendency to grow in the shade, Anubias nana was named after the Egyptian god of the afterlife, Anubis. The requirements for Anubias nana are fairly straightforward. Low-light conditions are best, as brighter lights can stunt the growth of this plant. Aim for pH levels between 6.0 and 7.5, a temperature between 72 and 82 degrees, and water hardness of 3–10 dGH. Anubias are hardy plants that can withstand most fish attempting to eat them, although, as with any rigid plant, shredders and big aggressive fish should be avoided. Anubias nana offers excellent cover for small fish and fry. It’s compatible with most other plants. Anubias nana is notorious for growing at a crawl. The only special care it needs is its fill of nutrients. You will not have to trim it often. You want a minimal effort plant that you can mostly leave to its own devices. If you want a fast or even moderately fast-growing plant that you can work on and nurture. Color form: Green or yellow. Spiralis is a tall, bright species with serrated leaves. It can be either green or yellow, depending on your water’s conditioning. It can grow as tall as 1.4 feet and makes a great background plant. But because of its sharp look, it’s often preferred as a centerpiece. Its flower is a spathe. Spiralis is endemic to India. As with most other crypts, it grows naturally in nutrient-dense water, alongside rivers, in marshes, and wetlands. Spiralis is said to be the oldest species in its family. You can grow spiralis in gravel, but a nutrient-rich substrate is best. Remember that this is a Cryptocoryne and will struggle with crypt melt at first, but once it adjusts to its new water it will sprout as though new. The best water to place it in is at temperatures of 72–82 degrees Fahrenheit. The pH levels should be between 6.5 and 7.5 (note that it can even survive at 6.0.) Water hardness can sit anywhere between 0 and 20 dGH but aim for 4–6 dGH for optimal growth. Spiralis has relatively good compatibility, but you should avoid cichlids as they will attack the leaves and ruin your plant. Minimal effort is required as this plant grows quite slowly and does not require special attention. You want a hardy plant that you don’t have give too much attention to, or are looking for pretty and full foliage to fill your planted aquarium. You want a plant that does not take up too much room. You’re a seasoned aquarist in need of more of a challenge. Color form: Red / green, pink flowers. Rotala rotundifolia is a giant plant that grows up to two feet tall. Although it reaches impressive heights, its leaves remain short. You can find it in shades of a pretty, pale red or green. Rotundifolia’s leaves are thin and, thanks to its color, it works well as a mid-ground focal point. It yields pink flowers if placed in the right conditions. Rotalas are native to Southeast Asia. They grow near rice fields and the wetlands of India, China, Taiwan, Thailand, and Vietnam. Rotala rotundifolia’s name means “round-leaved,” but the circular leaves it was named for are only found in its swamp form. Rotalas are adaptable plants that will be just fine in fluctuating pH and dGH levels. Regardless, it’s recommended that you plant them in water that has pH levels between 6.0 and 7.5, and a hardness level between 0 and 15 dGH. Rotala rotundifolia is a fragile species, so it’s advisable to not place it with aggressive or big fish that can easily cause damage. Since it grows so quickly, make sure that it won’t get in the way of other inhabitants. Regular pruning is required to prevent rotala from growing out of control and taking over your tank. You are looking to add color to your tank and don’t mind fast-growing plants. You have big or vicious fish that could damage the plant. You don’t want to spend a lot of time pruning. Color form: Green / red. Since they are closely related, this plant is quite similar to Rotala rotundifolia, but it’s a myth that they are one and the same. There a few differences which might make you prefer one over the other. Like its cousin, Rotala indica can reach heights of two feet tall. What makes it different, though, is that its leaves are rounder, and the reddish color is typically only found in its stem. Despite the name, this plant has been introduced to (and is now found naturally in) the Congo, Portugal, and parts of the United States. 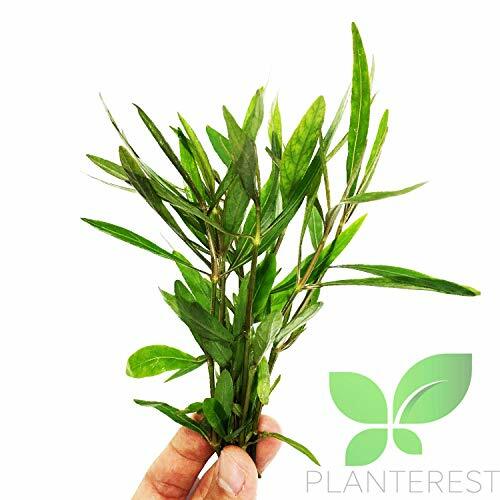 As with rotundifolia, Rotala indica can withstand fluctuating conditions. Its parameters also differentiate it from its cousin, with indica preferring pH levels between 6.5 and 7.5, a much wider water hardness range of 0–15 dGH, and slightly warmer temperatures of 72–89 degrees. 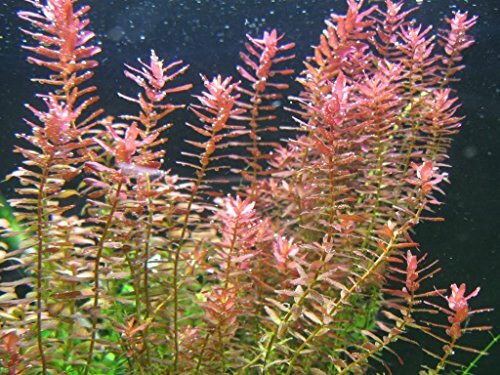 Rotala indica is fragile and can be easily damaged by big, vicious fish and shredders. You will have to keep an eye on this one’s growth as well, as it could interfere with other plants and get in the way of fish. Since it’s a fast-growing plant, regular trimming and maintenance are required to keep it in order. You appreciate its unconventional pigmentation. You won’t mind taking care of a fast-growing species. If you have fish and predators that could damage it, you don’t want to spend too much time nurturing and trimming this plant. Or, you don’t mind the maintenance but would rather have the more colorful rotundifolia. Moneywort is an amphibious plant with bright green-yellow leaves. It’s categorized as a non-aromatic herb. Its leaves are small, with a maximum length of 0.24 inches, oblanceolate (have the pointed end at the base), and bear white flowers. It can grow to eight inches high. 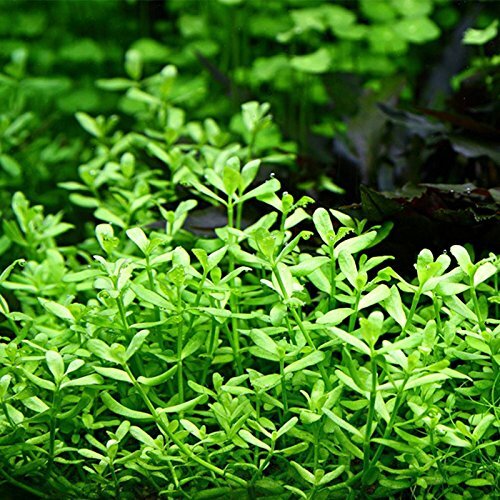 There are many different plants listed as moneywort, but this particular variety – Bacopa monnieri – is the one that grows easily in water and is a popular choice for aquarists. Moneywort is native to every continent of the world but is most commonly found in Eastern and Southern India. It is also known as Brahmi, an Ayurvedic herb named for the Hindu creator, Brahmā. It’s a perennial plant that grows in damp conditions, mostly in marshes, bogs, and ponds. Since this is a beginner level aquarium plant, its required conditions are simple. It is a rooted plant, so a nutrient-rich substrate will go a long way. Preferred pH levels are 6.5–7.5 and it can withstand hardness between 8 and 30 dGH. Temperatures are average with a range of 72–82 degrees Fahrenheit. Moneywort has excellent compatibility with most plants and fish and will survive in almost any tank conditions that you set it in. It prefers to grow in the shade, so adding floating plants above it will be to its benefit. Moneywort is an undemanding plant that grows moderately slowly, but pruning every so often is recommended in order for it to look its best. No other maintenance is required. If you want a species that is easy to grow and works well with most other creatures and plants. You’d rather invest your time into more difficult plants and aren’t particularly interested in aesthetic effects. For the most part, low-light aquarium plants are simple to grow and rarely require much more than pruning. As you’ve seen, our list of the best low light aquarium plants is full of species that will get along with other plants and your fish. Provided the water conditions match, of course. Unless it’s specified that your plants require high light levels, many varieties will thrive in low-light conditions. It’s a great place to start if you are a beginner, and it can be a fascinating change if you are an experienced aquarist who is looking to experiment. The best part is that we have only listed our favorites. There are many, many more species out there to learn about and acquire. Have we missed any essential low light plants that should be on this list? Would you like extra information on low-light aquarium plants? Or perhaps you just want to tell us your story? If so, let us know in the comment section below! We love reading your comments, and we will respond to every single one.